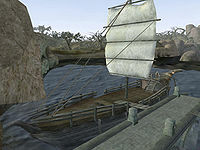 "The Eternal Voyager, Lower Level"
"The Eternal Voyager, Upper Level"
The Eternal Voyager is a ship owned by Andrere Moriard, that ferries passengers around the southern Sea of Ghosts from the docks in Helnim. Travelers may be worried if they knew what was in the captain's cabin: bottles of Llotham, Plallo's Vineyard Wine and Mazte don't suggest a high level of sobriety. There's also a bottle of Surilie Brothers in the Upper Level along with a barrel full of other wines. The main cargo of the boat seems to be armor and weapons, though, with crates of the stuff to be found in both decks. This page was last modified on 6 March 2019, at 09:01.